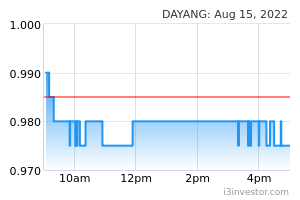 Dayang Enterprise Holdings Bhd is an investment holding company. The company provides offshore topside maintenance services, minor fabrication works and offshore hook-up and commissioning services for oil and gas companies. It also offers chartering of marine vessels, and equipment hire operation. Its operating segments include Topside maintenance services, Marine charter and catering income, Equipment hire and Investment holding. Dayang generates most of its revenues from Topside maintenance services. SaveMsiaFromPHGov Uh huh. So, Dcmh, you really get off on it, shorting your klit all the fukkin time, aye. SaveMsiaFromPHGov Dia kena logol gaw gaw satu kali, baru la dia tau. Bizfuneng Price up but vol is miserably low. UnicornP Their annual report very upbeat. 2018 is a turnaround year and 2019 is another good year. Also appreciate investors' interest. But I think 2019 is reaching mature stage. Beyond 2019 is hard to see as they are still betting on Perdana synergy. nestor i think people scare it will happen like last week, from 1.6 drop back to 1.3x. hopefully this time can stay above 1.45 for few days. Michael Kwok One thing it's need to build strength for breakout.Its not 1.48 but the most safest is above rm 1.53-1.55 high volume.Need to be above there for 3 consecutive days without major selling. 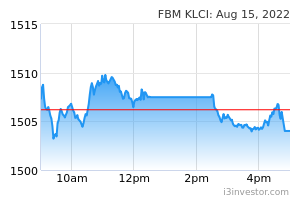 tah16600 Which funds manager kept buying at RM 1.49? rr88 Cant believe your eyes? Its not magic. It could not move beyond 1.53 bcause there is a descending triangle line there. It will seriously drop below 1.33. You hv one month to get the hell out of there. rr88 is right descending triangle. Iamyou Bermuda triangle also cannot stop Dayang. rockycleft Wah.....sure can spit poison. pjseow I just read a report by AmInvest upgrading the tgt price of SERBADK to RM 6.50 by giving a PE of 20x of 2019 projected earning. I tried to compare Dayang with Serbadk in terms of profit margin, revenue growth , cash generation,loan and borrowings , I do not find Serbadk very much superior than Dayang except probably its ability to get renewed and repeated orders . Dayang 's profit margin and cash generation are much better than Serbadk while the growth rate for 2018 and 2019 could be the same .THe net borrowing for both companies are almost the same at about 1.1 billions. Serbadk is going for a sukuk roadshow raising fund to finance its borrowing. THis is seen as "positive" by analysts while Dayang's RM 1.06 billion loan is seen as negative despite its ability to repay RM 700 million for the last 3 years . I feel that Dayang was unreasonably " punished " by not even accorded a PE of 6x of 2019 projected earnings when its target price was between RM 1.15 to 1.30 only . pjseow I have also just browsed through Dayang's 2018 Annual report . The 2018 was a record year in terms of Revenue and profitability. The Chairman attribute the Dayang and Perdana 's synergy which made Dayang in a much more competitive position . He is very confident and optimistic Dayang can repeat 2018 result in 2019 premised on its 3 Billion order book which can last for the next 3 years .He is also very confident that the balance sheet will be improved further with its about 300 million per year nett cash generation. He repeatedly mentioned the synergy of Dayang with its subsidiary Perdana will enable Dayang to move forward with greater competitive advantage . DreamConqueror Has Trump quit on pressing oil prices down? Ha ha ha. Apparently, he has. Now, most of us all already quite well know what a big iddiot he is. Problem is, an iddiot takes much longer to realise what an iddiot he himself really is. Just like he took so darn long to wise up to the fact that Mr. KJU is never really going to give up his nukes. riko Don't shoot too much on rr88..
SaveMsiaFromPHGov Kids? She is not a "he". She is a frustrated unmarried old maid with a sore arse & a stinkin sour poosey. That is why she is always acting weird all the flippin time.